How different would your Williams experience have been if more faculty looked like you? 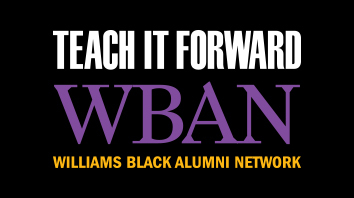 As part of Teach It Forward, the college’s comprehensive fundraising campaign, we are launching Teach It Forward: WBAN Challenge, seeking to inspire Black alumni to take up Williams as our cause as we honor the legacy of Williams’ first Black graduate, Gaius Charles Bolin, Class of 1889, and advance the college’s efforts to transform the academy. Williams’ Gaius Charles Bolin Fellowships are designed to promote diversity on college faculties by encouraging students from underrepresented groups to complete a terminal graduate degree and to pursue careers in college teaching. We want you to know more about the great work happening at Williams to build a community you will be proud of. Tune into one of our Community Phonecasts to hear current students, faculty, administrators and alumni talk about the Williams of today. Community Phonecasts are a great opportunity to be an active audience member of a panel discussion without leaving the comfort of your home or office. We’ll call you at the appointed time and you can listen to the panel discussion and then ask questions! April 9, 2019 at 1:00pm EDT – Michele Johnson Rogers ’79 P’04 will host a conversation with Rhon Manigault-Bryant, Associate Professor of Africana Studies and Faculty Affiliate in Religion, where they will provide a recap of the 50th anniversary celebration of the existence of Africana Studies at Williams, and a discussion on the future of Black Williams. June 7, 2018 at 2:30pm EDT – Michele Johnson Rogers ’79 P’04 will host a conversation with Elizabeth Creighton, Dean of Admission and Financial Aid, where they will discuss how the admissions landscape at Williams has changed, the work that the College is doing to recruit students from underrepresented backgrounds, and the impact of the admissions process on Black students’ experience. Listen to the recording of the phonecast here. March 13, 2018 at 1pm EDT – Michele Johnson Rogers ’79 P’04 will host a conversation with James Manigault-Bryant, Associate Professor of Africana Studies and Chair of Africana Studies Department, and Leticia Haynes, VP for Institutional Diversity and Equity at Williams, where they will discuss the topic of race in the classroom. Listen to the recording of the phonecast here. December 13, 2017 at 1pm EDT – Michele Johnson Rogers ’79 P’04 will host a conversation with Jeff Harleston ’82, P’21 and Leila Jere ’91 about their Williams journey and their role as trustees. This is a unique opportunity to hear directly from leaders of the college and ask your questions about the Williams of today and how we are preparing for the future. Listen to the recording of the phonecast here. May 15, 2017 at 7pm EST – Michele Johnson Rogers ’79 P’04 will host a conversation with Mary Moule ’91 and Ken Alleyne ’88, co-chairs of the Williams Black Alumni Advancement and Development Committee (WBAAD). This sub-committee of WBAN exists to support the network in its work to enhance the engagement of Black Ephs by strengthening our philanthropic commitment to the college. March 15, 2017 at noon EST – Join Leticia Smith-Evans Haynes, VP for Institutional Diversity and Equity at Williams, as she discusses how her department is building and sustaining diverse, inclusive, and equitable communities on and off campus. Listen to the recording of the third phonecast here. January 17, 2017 at noon EST – Join Tyrone Scafe and Funmi Adejobi as they discuss their experiences as Williams students and board members of BSU. Listen to the recording of the second phonecast here. December 6, 2016 at 7pm– Why Bolin? Join Bolin Fellow in Math, Haydee Lindo ’08 and Associate Dean of the Faculty and former Bolin Fellow, Rhon Manigault-Bryant as they discuss why the Bolin Fellowship is integral to building a better Williams and strengthening the pipeline for faculty of color. Listen to the recording of our first phonecast here. Ensure that WBAN can get in touch with you, update your information in the Alumni Directory today! Support the WBAN Challenge: Give online today! $700,000 will support 6 Bolin Fellows over the course of our 3 year challenge!